Rob Schamberger is a Kansas City born and bred artist with a lifelong love of comic books, illustration, street artists, quality crime dramas, and other hipster things. He lives in a lovely loft overlooking the river with his wife and two cats. He has shown his work in numerous galleries and museums and his work is on permanent display in the National Wrestling Hall of Fame Dan Gable Museum, who named him as their official artist. Rob’s work has been published by Image Comics and The Kansas City Star. The Pitch named him the Best Sports Artist in Kansas City, Forbes declared he has one of the best deals in the art world, and his work has been covered by Sports Illustrated, USA Today, E! News and AskMen.com. His art has raised thousands of dollars for charities, notably with the Make-A-Wish Foundation. A who’s who of wrestlers, wrestling personalities and other celebrities have his work on display in their homes, and his paintings adorn the WWE corporate headquarters. He has painted posters for the movies Summer League and Meet Me There. Original portraits he has painted of WWE Superstars are being auctioned by WWE, and posters and prints are available from WWE Shop. 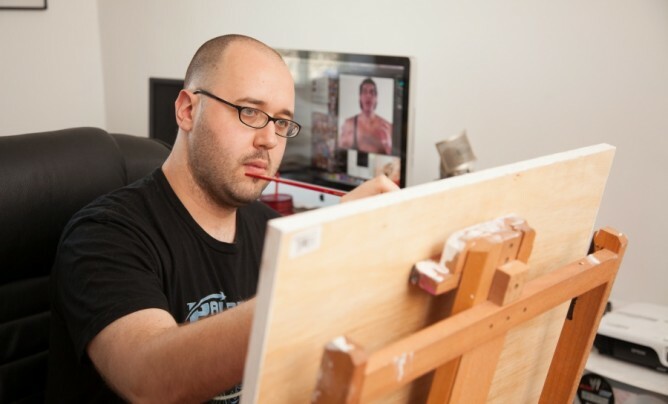 He has painted live for WWE at WrestleMania and SummerSlam, and produces weekly videos for WWE’s Canvas 2 Canvas web series.